My passion is Women Leadership, my mission is to enable you to reveal and to accelerate your talents as a woman-leader so you enjoy a fulfilling and rewarding career. Coaching usually takes places over a number of sessions/months however your need may not require it. 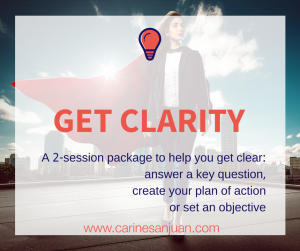 Coaching offers tools that are very effective to get clarity on a question or challenge or simply to take stock. And also if you are curious as to whether Coaching is for you, this Intensive enables you to do a test ! If you have a pressure point but don’t feel the need for a long-term coaching I offer an “Intensive” over 2 sessions. Or other professional challenges which today are heavy on your mind, using up your energy and your time with little results. Commitment is important to me and I expect commitment on your side too.